Vista III - with unsheathed competition lines for maximum performance. Vista Touring - same as Vista III, but with sheathed lines for durability and longevity. New APP Technology (Automatic Pressurized Profile) - commonly known as "Shark Nose" - installed for constant internal pressure allowing wider safe speed range and supperior glide. 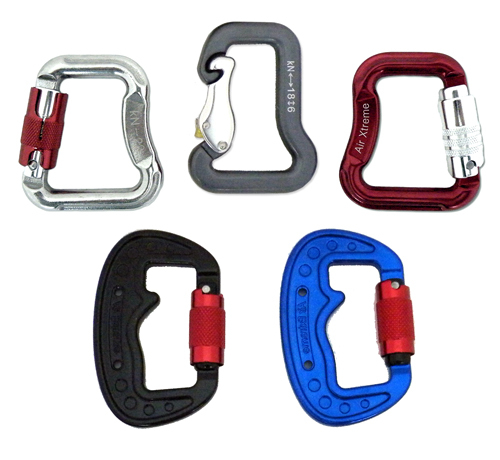 Vista III and Vista Touring are true 3 liner (top to bottom). Our comparison flights prove that both the Vista III and Vista Touring are at the top of their class, offering the optimal package for intermediate pilots - they are among the best performing wings in their Class. Simple and easy to fly, combined with extremely high passive safety, solid stability and probably the best handling around. Remember how when you were a kid you were always excited to open your gifts on Xmas morning, finding new toys to play with. Vista III and Vista Touring are so much fun to fly that when flying on of these wing, you will feel like that kid once again !!!! 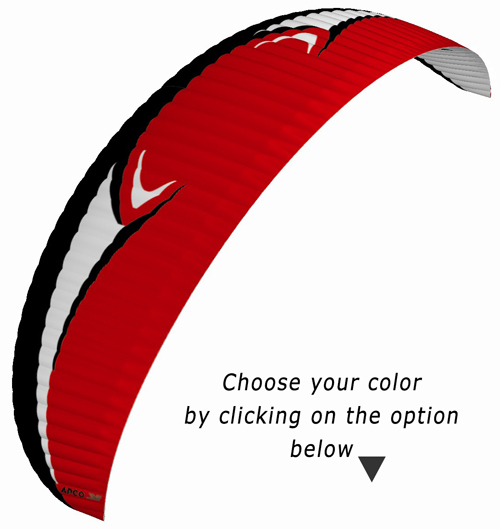 Our main effort concentrated on achieving extremely stable, yet playful wings with fully usable speedbar that should stand out in a crowd, making you look good while soaring at the top of the gaggle. We believe the results are evident. Using a true 3 line concept, combined with APP technology + drag reducing bullet risers and unsheathed lines, as well as APCO's innovative minimal drag hook up points , were our tools of choice to achieve ultimate performance with no compromise on safety and fun. Building Vista III and Vista Touring we implemented all the latest technology available at APCO, creating the wing to beat the competition, making it lighter than most rival gliders, but also faster and sweeter, without sacrificing any of APCO's legendary tradition in wing durability and longevity. 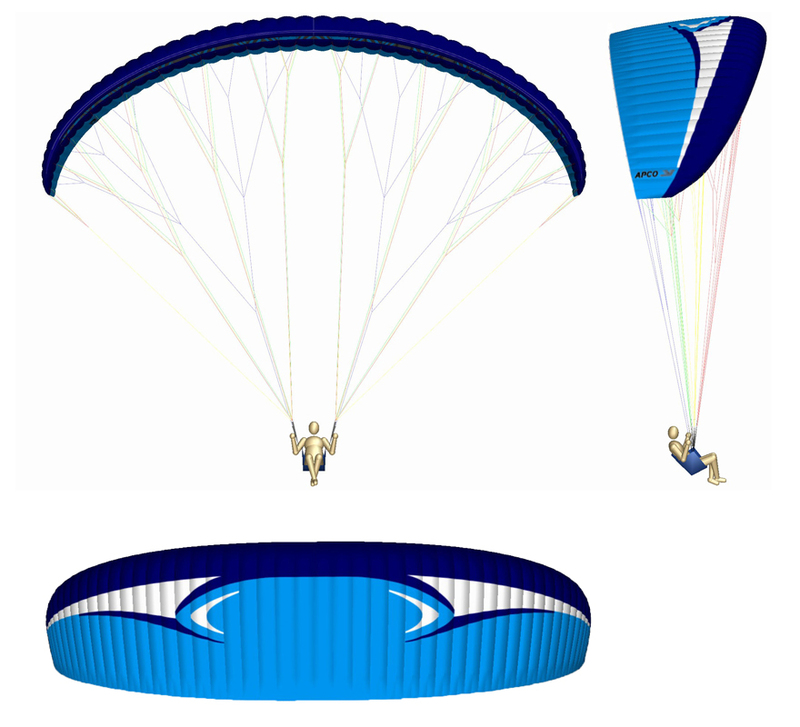 Vista III is equally great for both free flying and for paramotor flying. It especially excels when flying under power with a small, weak engine due to the outstanding performance of the classic profile combined with Shark Nose (APP). Speed bar with handsfree operation! Durable, Comfortable. Large Carry Bag for Quick packing of all your equipment. Holds unfolded glider, Harness, Helmet, etc. Durable, Comfortable.Made from LightRipstop material. Large Carry Bag for Quick packing of all your equipment. Holds unfolded glider, Harness, Helmet, etc. easily and quick. The Vista III comes in an ergonomic rucksack incl. an inner stuff bag, compression strap, riser sock, spares kit, owner's manual and an industry first 3 yr/250 hr warranty - all as standard.